This Fair Isle border pattern uses five colors, so experiment a bit with your graph paper and colored pencils to get the Fair Isle border look that you’re after. Even though five colors are used in this Fair Isle border, remember that you’re using only two colors in any row — so the knitting will be the same as it is for a two-color pattern. Reading this chart may demand some attention; using a ruler or sticky note to mark what row of the pattern you’re on can help. 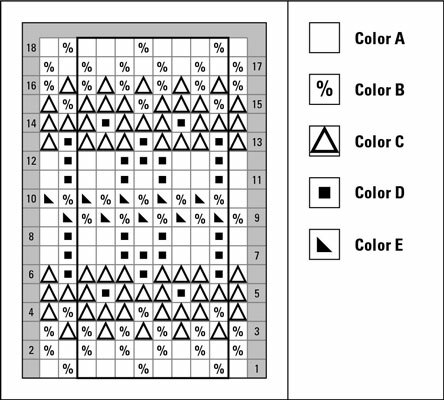 Before you start a new row, take a moment to see which two colors are used in it. Cut the yarn for any color you won’t be using in the next couple of rows and leave a tail to weave in. Taking time to keep your yarns tidy helps prevent irritating tangles down the road. 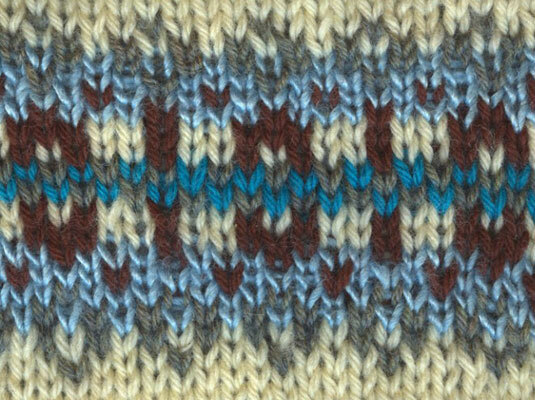 It’s always smart to make a swatch with a Fair Isle pattern because you want to make sure that your gauge is right. Swatching also gives you a chance to see what the pattern will really look like knit up.